Dr. Caldicott was interviewed in Oakland, California by TUC Radio host Maria Gilardin. 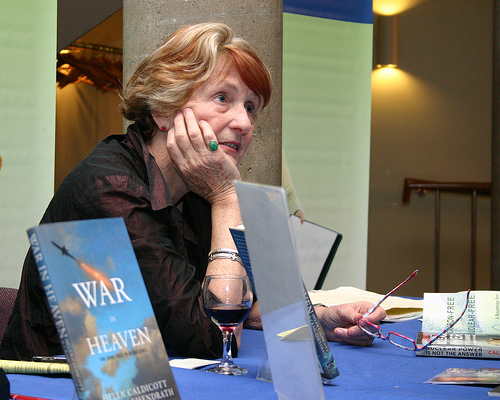 Dr. Caldicott’s latest book, If You Love This Planet, was published in September 2009 by W.W. Norton. The fully updated and revised edition of the volume first issued in 1992 covers all the major world environ-mental crises, such as global warming, toxic pollution, ozone depletion, defores-tation, species extinction, and radiation. In this in-depth interview, Gilardin asks Dr. Caldicott about many of the topics addressed in If You Love This Planet, and how the world ecological situation has changed since 1992. If You Love This Planet also covers the growth of corporate power in the 20th and 21st Centuries, and how transnational corporations and complicit mass media are allowed to destroy the planet by equating unrestrained free enterprise with freedom and democracy. This entry was posted on Monday, March 29th, 2010 at 12:00 am	and is filed under Uncategorized. You can follow any responses to this entry through the RSS 2.0 feed. Both comments and pings are currently closed.